As I mentioned in my Nov. 6 post, the place where Australia’s first settlers started their colony, while wonderfully protected, with fresh water available, was pretty much a slab of rock under very little top soil. As a result, people were soon exploring the surrounding countryside. 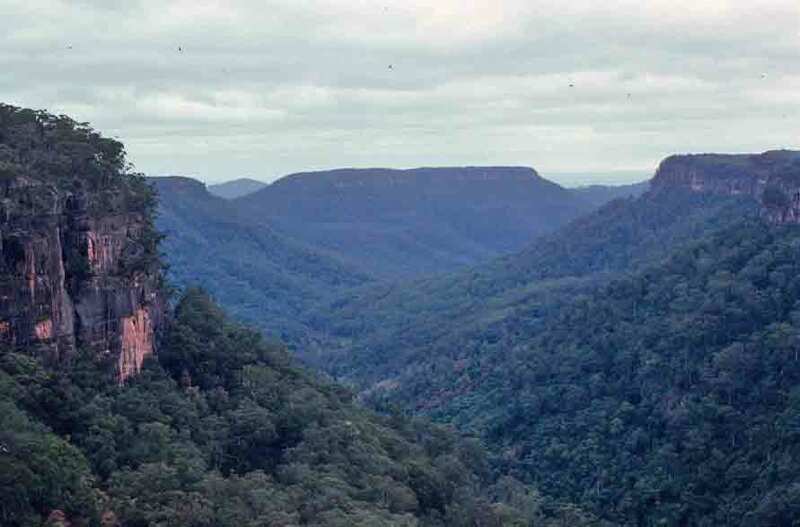 One of the areas they explored was a forested region of steep cliffs and waterfalls a little more than 100 miles south of Sydney. While mining and a few modest farms took root in this area in the early 1800s, people soon began to realize that this area was worth protecting. In 1824 the residents of Bundanoon established a small reserve and created trails and lookouts. It was soon a popular tourist destination, especially once a railroad was put in. The reserve expanded. Then, in 1938, a proposal was pushed through Parliament in 1938 that created a 60,000-acre National Park for the Preservation of Native Flora and Fauna, largely through the efforts of Mark Morton. It was this sprawling property that became Morton National Park. Since then, the park has grown, absorbing smaller reserves, including the old one at Bundanoon. Today, the park’s highlands and valleys are popular with bushwalkers, who enjoy the many trails that weave through the forests. Myriad wildflowers crowd between the trees, and birds add to the music of the wind and falling water. It is a thoroughly enchanting place. Clearly, on a day trip, I couldn’t begin to see more than a small part of this enormous park, but that small sample was delightful. 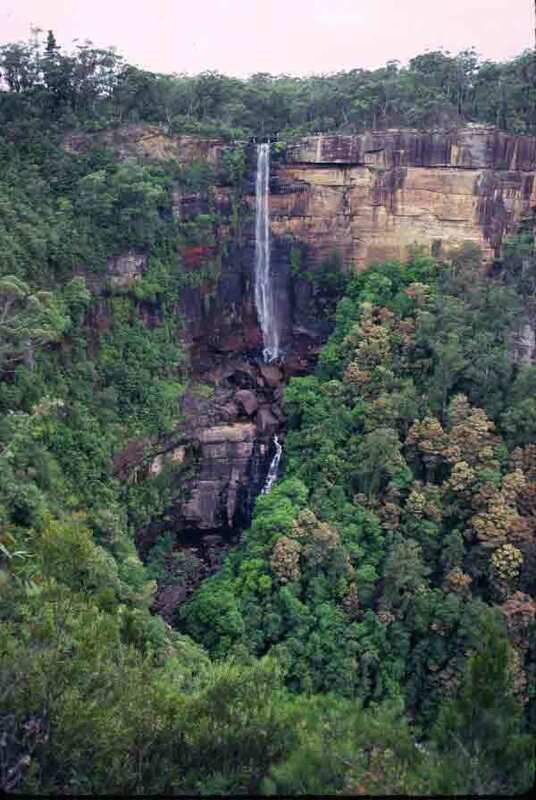 Fitzroy Falls is a popular starting point, and that’s where my friends and I started. 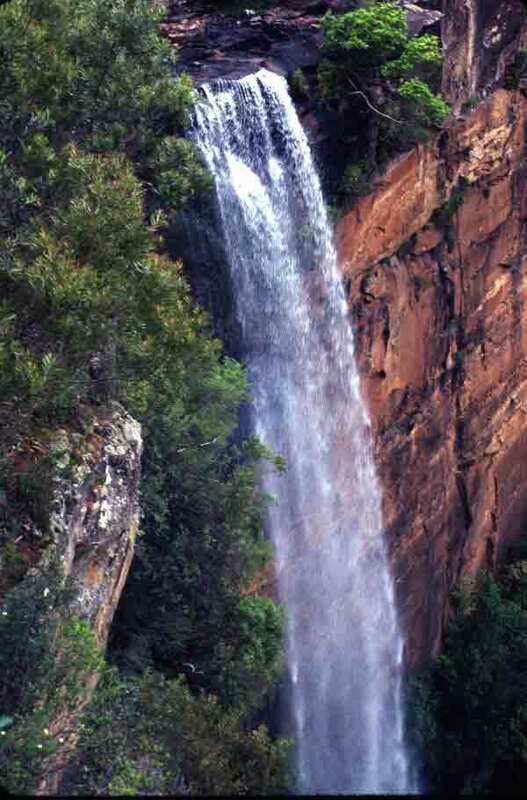 Below, the photos show the top of Fitzroy Falls, a view of that part of the park visible from the trail near the falls, and a look back toward the falls after our hiking, climbing, and wandering amid the foliage brought us to a point of the rim that offered a splendid view of the valley. Taking a long drive out of Sydney with friends, en route to Morton National Park, we passed through the town of Thirlmere. 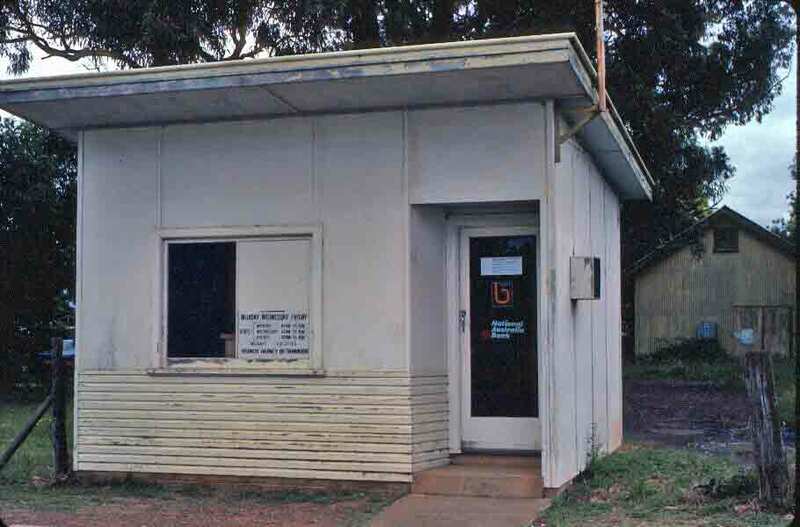 In the book, I mention that the local bank looked more like a roadside fruit stand than a financial instution. Just to make sure you don’t think I was exaggerating, here’s a photo of the bank in Thirlmere. I was quite delighted with the charming innocence of this modest little bank. It seems to send the message that this is a very safe town. The splendid sweep of Macquarie Street ends at St. James’ Church, where it splits into Prince Albert and St. James roads. Beyond this split is Hyde Park, a sprawling, green oasis in the heart of the city. This handsome park, with its wide, tree-shaded walkways and broad lawns, attracts workers from the surrounding downtown buildings, many of whom resort here to enjoy the greenery and sunlight during lunch breaks. Just inside the park, if you’re coming from Macquarie Street, one of the first things you’ll see, other than trees and people enjoying the beauty of the spot, is the Archibald Fountain. This grand fountain, with its mythological figures, is a favorite spot in Sydney. The fountain, built in 1932, is named for J. F. Archibald, who bequeathed it to the city. Archibald was a journalist who, with a partner, founded in 1880 The Bulletin, a weekly paper that was to become a cultural icon in Australia. The Bulletin published political and business news, and was tremendously influential for a while, but it was probably even more influential as a literary magazine. Reader contributions were first encouraged in 1886, and the paper was soon filled with poetry, short stories, and cartoons from Australians, many of whom would in time become famous and define Australian literature. It launched the careers of many of Australia’s best-known writers, including A.B. “Banjo” Paterson, Henry Lawson, Miles Franklin, and Harry “Breaker” Morant. Paterson’s “The Man from Snowy River,” one of Australia’s most famous poems, first appear in The Bulletin in 1890. The Bulletin changed and declined in influence after Archibald’s death, becoming less and less in touch with its readership and hopelessly outdated. It was sold and resuscitated in the 1960s, with new writers and focus, but finally ceased publication in 2008. Archibald and The Bulletin are still part of the iconography of Australia. As long as Australia values its literary heritage, The Bulletin will be remembered. Archibald’s estate at his death in 1919 was considerable. His will left two impressive gifts for his hometown: the Archibald Prize for portraiture, now one of Australia’s most prestigious art awards, and the Archibald Fountain. 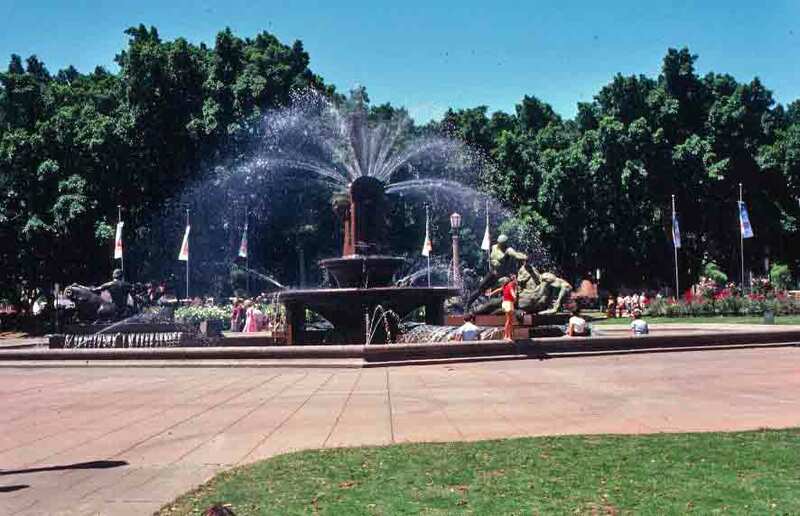 However, the fountain was for more than just Sydney; it was intended to commemorate the association of France and Australia during World War I. Actually, while I might not agree that Australian history is the chiefest novelty the country has to offer, I do agree it’s generally pretty unexpected—and has continued to be so, long after Twain penned those words. For example, what other country can you think of that has featured a convicted forger on its money. Of course, if you read the post on Entally House, you’ll already know that Australia was not averse to picturing convicts on its money, but there is a special quirkiness in showing a forger. Of course, Francis Greenway wasn’t just a forger. He was also a skilled architect, born into a family or architects, builders, and stonemasons. However, Francis liked to get his own way, even when it meant a little criminal activity, such as forging documents. He was sentenced to death in England, but that was changed to transportation, which is how he wound up in Sydney in 1814. Fortunately for Greenway, Lachlan Macquarie was the governor at the time, and Macquarie had big plans for Australia—plans that would benefit from the skills of an experienced architect. Macquarie had begun building schools, courthouses, roads, and hospitals. Suddenly having the convict-architect Greenway available made Macquarie’s grand vision seem more accessible. At first, Greenway was just an advisor, but by March 1816, he had been given the job of civil architect and assistant engineer. His first official project was designing a lighthouse for the south head of Port Jackson. The stonework alone was so impressive that Macquarie offered Greenway a conditional pardon. 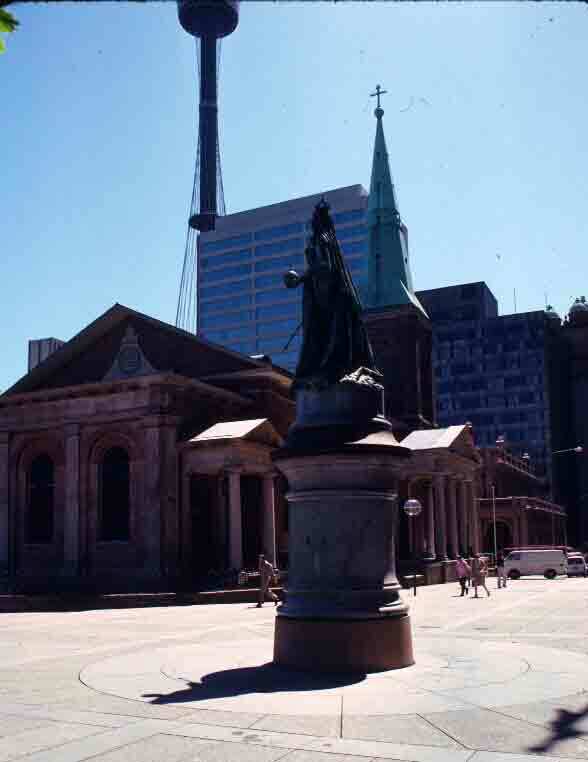 Of Greeenway’s varied projects for the colony, two of the most notable can be seen along Macquarie Street: The Hyde Park Barracks and St. James’ Church, which face each other across Queen’s Square. While both buildings are handsome examples of the Georgian-influenced architecture that became known as Macquarie Style, St. James’ Church is surprising in that is has been in continuous use for its original purpose since it was consecrated in 1824. The barracks are a museum now, but the church is still a church. St James’ Church, shown below, was not only designed by a convict, but was also built by convict labor. It is the oldest surviving church building in the City of Sydney. And Greenway’s contribution to the city’s early growth was remembered by placing him in 1991 on the $10 note. Macquarie Street is a grand place for a stroll if you like history. The street is lined with buildings that date back to the era when Sydney was becoming more than a penal colony, thanks in large part to Governor Lachlan Macquarie, who felt the new land had the potential of becoming something special. In fact, Macquarie’s impact on the colony is such that his grave stone bears the inscription “The Father of Australia.” When he arrived in 1810, there wasn’t much to suggest that Sydney had the potential of being anything grand, but Macquarie began to lay out street plans, get exploration under way, and look among the convicts for talent to help carry out his vision. One of the first things he wanted to do was build a hospital. Britain was not interested in funding Macquarie’s grand plan to create decent facilities for a convict colony, so Macquarie approached a group of businessmen. In exchange for a three-year monopoly on importing rum, would they bankroll the hospital? They said yes, and as a result, the sprawling medical complex that was constructed between 1811 and 1816 was nicknamed the Rum Hospital. In 1927, the official money-making operation moved to the federal capital in Canberra. The Sydney Mint was fixed up and served as a museum for the next several decades. During my first trip to Australia, it was operated as a Museum of Applied Arts and Sciences. If you’re reading my book, you’ll know that I loved this museum. However, the admirable collection has now been moved to the Powerhouse Museum (another museum I very much liked). 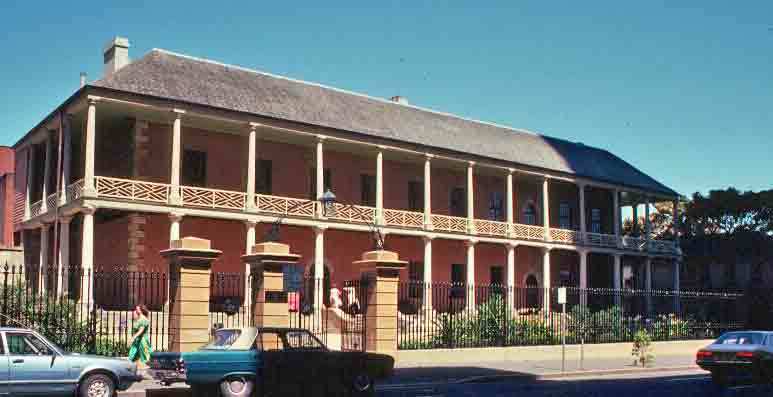 In 1998, the Sydney Mint was turned over to the Historic Houses Trust. It is still open to the public, but now only offers a café and a display about the history of the site—though that is certainly worth learning about. Because for most of my teen years I had thought I’d become a marine biologist, when it was time to head for college, I picked a school near water. I had visited California a number of times with my family, loved it, and had a list of schools to check out. However, when I visited a friend at Westmont in Santa Barbara, I knew I’d found the place for me. A small, private college with an outstanding biology department in one of the most beautiful settings on the planet. Among the things I fell in love with in Santa Barbara were the trees, especially the abundant eucalyptus trees, but also one particularly astonishing tree between the highway and the railway in downtown Santa Barbara: the city’s almost legendary Moreton Bay Fig. I soon learned that it was started from a seedling brought from Australia. 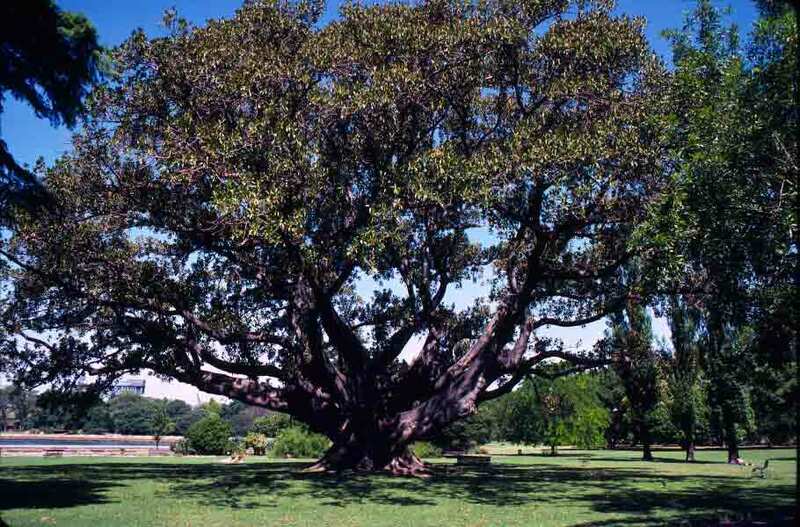 The Santa Barbara tree is not the only fig transplanted from Australia, but it is thought to be the largest Moreton Bay Fig in the United States, and it has been placed on the California Register of Big Trees. I was amazed by this fabulous tree, with its massive trunk (nearly 42 feet around in the ’90s), twisted buttress roots, and huge, wide-spreading branches. Then I went to Australia. Of course, I soon learned that all of California’s eucalyptus trees were also transplants from Down Under. (Southern California was pretty much a desert before people started settling there—and started looking for things in other dry places that might do well in the arid terrain.) I also learned that Moreton Bay Figs were, though still impressive, relatively common on Australia’s eastern seaboard. The trees are named for Moreton Bay in Queensland, but they range along the coast from northern Queensland down through New South Wales. The Sydney Botanic Garden perches on the shore of the lovely harbor, running pretty much from the parking lot of the Sydney Opera House to the heart of downtown. Strolling through that garden, I saw a much younger, much more modest example of this tree, but still large enough hint at its potential to rival the monster in Santa Barbara, as you can see below.